7/16" dia. dark brown stamp. Possibly an "out-of-stock" expedient or the original Chicago startup mark. Very rare. 9/16" dia. red stamp. An interim mark during the expansion into the carriage barn studio. Infrequently found. 13/32" dia. brown decal. The first mark used at the Ravenswood studio. 13/32" dia. red (early) or black (later) decal over gold maple leaf. Covers blank mark (early) or beside blank mark (later). Other dias. : 1/4", 21/64", 3/8" and 25/64". 11/16" wide black decal used on a small number of pieces at end of World War I. Infrequently found. 19/32" dia. etched gold coin. 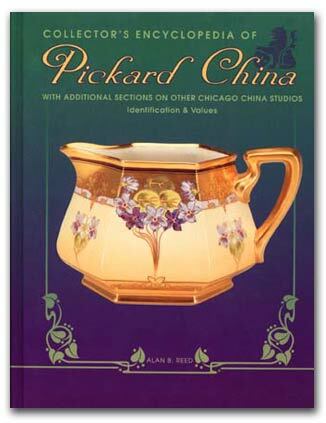 Used 1912-1922 for etched dinnerware, 1922-1925 for all china. Small etched gold or platinum escutcheon used on smaller items. Small gold decal escutcheon used on salts and other small pieces. Gold stamp used on Chicago's Century of Progress World's Fair souvenir plates. Scored trademarks were a means of identifying factory-vended seconds. 1/4" h. Hand painted in gold. Used in hand-painted glass only. Current pattern trademark including name of pattern. Pickard trademark superimposed on top of the American flag used on giftware and specialty items.